Rooting shank (Oudemansiella radicata), also named changgenoudeman, changgenjinqian, lushuijicong, and tea plant fungus, belongs to Oudemansiella, Tricholomataceae, agaric order, Hymenomycetes, Basidiomycete subphylum, Fungi phylum. It is the familiar soil-growth wood rotting fungus in the north temperate zone. The mushroom that is slender, tender and delicious is abundant in multi-nutrition components including proteins, amino acids, fats, carbohydrates, vitamins and microelements. 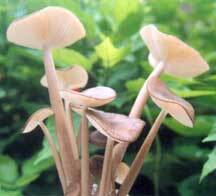 Because the mushroom is grown in summer and autumn when other mushrooms are lesser so that it is even more rare. A kind of factor isolated from Rooting shank and harbored in the culture liquid of the mushroom, is greatly benefit to hypertension patients as well as they take medicine of other druggery to drop blood pressure. The mushroom could be sold in fresh or insolated form. The former is fresh, brittle and slippery while the latter is strongly fragrant. The price of insolated form is between 180 and 220 Yuan per Kg. Planting this mushroom could bring great economic benefit and vast market. Our institute plant experimentally it firstly and have done the trick. We have stocked high quality and high yield strain. Welcome vast planting doors come to here to consult and shop. The fruit body grows in single or grouped form. Its pilei range from 2.5 to 12 centimeters. And the pilei vary from half ball to applanate with heaving or concave middle part, which has radiation ripples in deep colors such as sandy beige, puce and black brown. Moreover, the pilei is velvet, wet and viscid whose flesh is white and thin with white, bending, relative long gills. The gills are slightly sparse and have different lengths. The sandy beige, nearly velvet and frequently skew stipe is approximately pole, ranging from 5 to 15 centimeters lengths and from 0.3 to 1.1 cm thickness. The coat of stipe is brittle and boning. The inner fibrins of the stipe are soft. And the base of the stipe slightly swells and is elongated to fake roots. The growth temperatures of hypha are between 12 and 35°C while the most suitable temperatures are between 20 and 26°C. The temperatures of fruiting are between 16 and 30°C while the most suitable temperatures range from 23 to 25°C. Planting seasons are between March and April and between August and September. It is better to be planted in coteau or in farmlands at summertime. Cottonseed nut 40%, wooden bits 39%, wheat bran 20%, calcium carbonate 1%, water 100%. wooden bits 79%, wheat barn 20%, calcium carbonate 1%, water 100%. The mushroom could be planted in clean, bright and ventilated mushroom houses and other houses grew Tremella fuciformis Berk or Agrocybe chaxlngu Huang. Also the farmland beds of summer’s Lentinula edodes (Berk. )Peglet are fit for the growth of mushroom. According to the material components, trying to entirely mix the materials, altered pH values to 5.4-7.2 after added water up to one times of the materials. Using 15×30×0.05cm planting bags that were made from polyethylene or polypropylene, the above materials are bagged. Then using materials such as plastic ringers to tighten the bags. Do lightly hold and discharge them. sterilization in ordinary pressure in the way keeping the temperature in 100°C for 26-28 hrs. It is time to inoculate the mushroom after sterilizationis over and the temperature is 30°C hereinafter. 6. The management of spawn running and fruiting. The phase of spawn running is the hyphal culturing period. The inoculated bags is placed in planting houses whose temperature is 24-28°C and relative air humidity is 50-70%. The hypha could extend to the culture of bag two days later. Do keep fresh air during the whole day and go along ventilate house and exchange gas in the morning and evening. The growth of hypha doesn’t need light. After 30-45 days, the hypha may overgrow in the planting bags and reach physiological maturation 20-30 days later. It is only mature planting bags that could be fruiting. When the medium surfaces of the bags begin to come forth-small black and brown button which are single or grouped, the bags could be transferred to bright mushroom houses and opened to fruiting. Then spraying water on the medium surfaces and keep the relative air humidity of mushroom houses maintaining 85-95%. At the same time, the houses must be given dispersion light and ventilation. Also, it is necessary to control the concentration of carbon dioxide which should be lower than 0.03% and the room temperature which should be between 16 and 30°C and is best in 25°C. Do not ignore to prevent and cure diseases, insects and acarids. It is time to harvest the mushroom when the pilei have opened 80%. Oppositely, do not harvest them after abundant white spores have come loose and the fruit body have fell down and the gills have turned yellow. People could gain 25-40 g dry mushroom from every bag. The mushroom could be sold after using a knife to scratch the base of the mushroom clearly or using a spin-drier to dehydrate and dry the mushroom. Do give attention to classify the mushroom before bagging them.